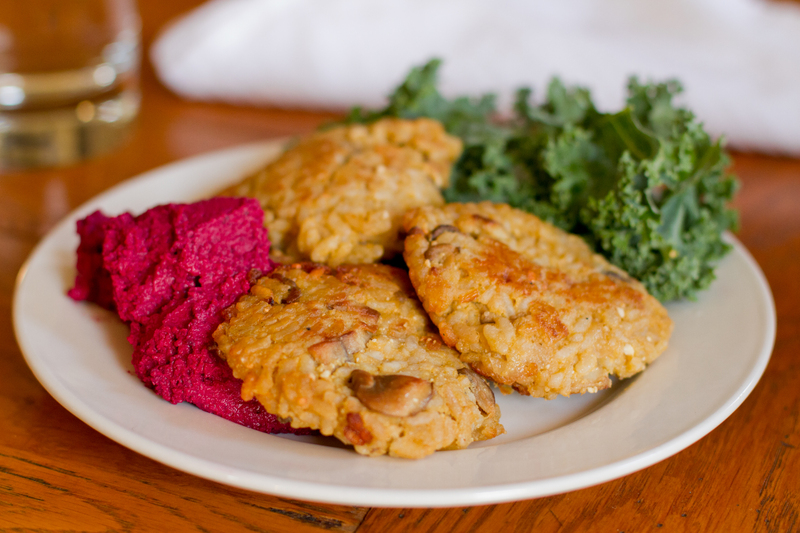 Cheesy Mushroom Risotto Fritters with Beet Hummus. First of all. 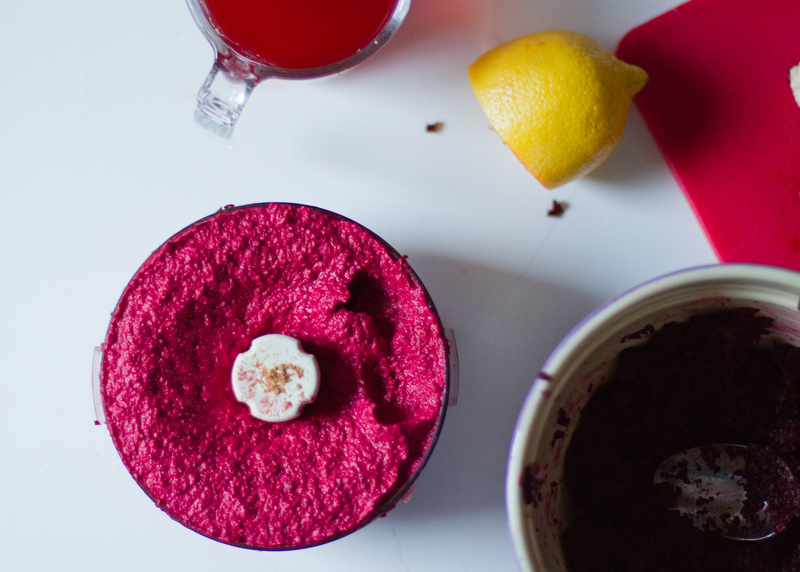 Can we talk about the color of the beet hummus? These pictures have not been enhanced in a way that has changed the color of the hummus dramatically. It actually looks like this in real life. And you can eat it. And it’s all okay. Beets have been a favorite of mine for a while now. You can pickle them. Put them in a salad. Slice them and make chips. Put them in chocolate cake. (Yes, you can. My pal Joy the Baker shows you how.) The list goes on. I put them in hummus this time around. And then paired that with cheesy mushroom risotto fritters. Although it involves a little more time than some dishes (because you’re making the risotto from scratch) the reward is definitely worth the effort. You could actually make the risotto as a dish on its own for one night, and then use the leftovers to make the fritters the next. You could. I couldn’t, I don’t have that kind of patience. 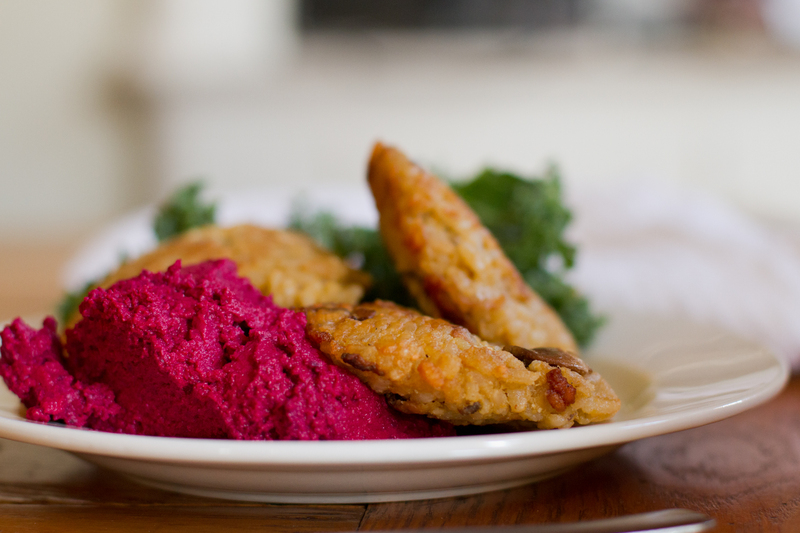 The risotto and the beet hummus really compliment one another well, and the hummus transforms itself into a dipping sauce of sorts for the fritters. 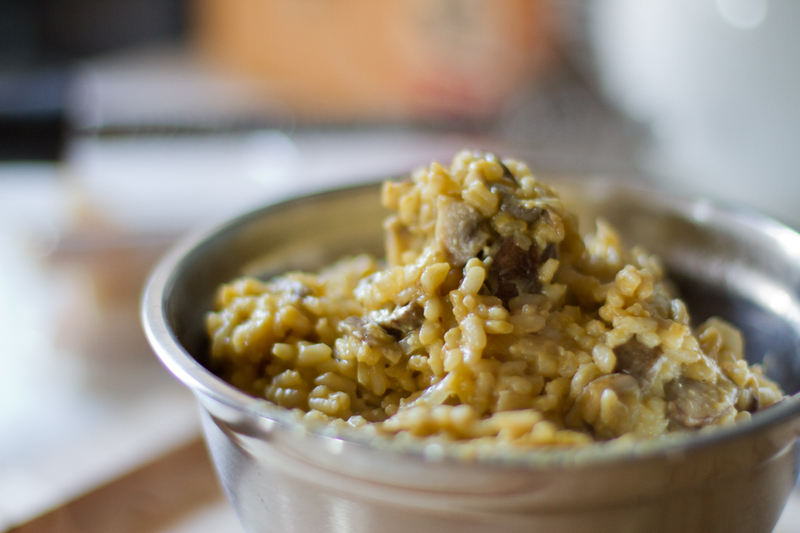 Once you’ve cooked the risotto, you need to let it cool for about an hour. 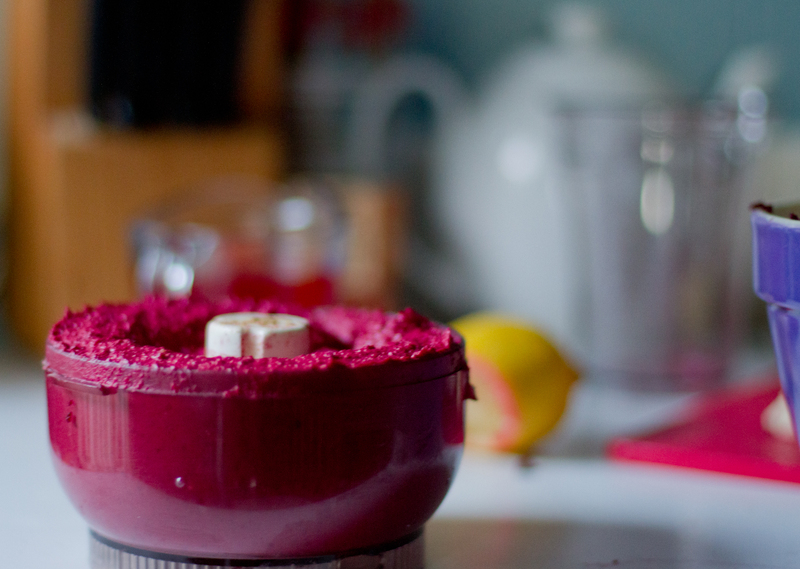 This is the perfect time to make the beet hummus! Now that you’ve made that (it is insanely simple to make), set it aside and let’s get back to the fritters! 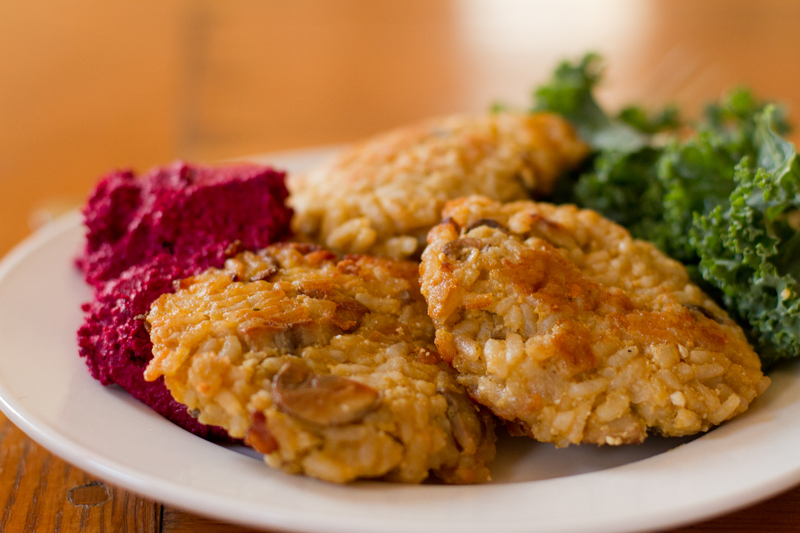 Take the cooled risotto and shape it into little patties. Throw those into some hot oil (I prefer grapeseed oil for frying) and brown ’em up! At this point of the process, I had made myself pretty freaking hungry. Next step is easy, just plate it and indulge. Bring vegetable stock to a boil in a pan and reduce to a simmer until needed. Heat oil and butter in a large frying pan. As onion and cook until soft, about 3 minutes. Add in all of the rice and stir to mix with onions for about 2 minutes. Add mushrooms and cook until soft. Put in vegetable stock little by little, using about 1/2 cup at a time. 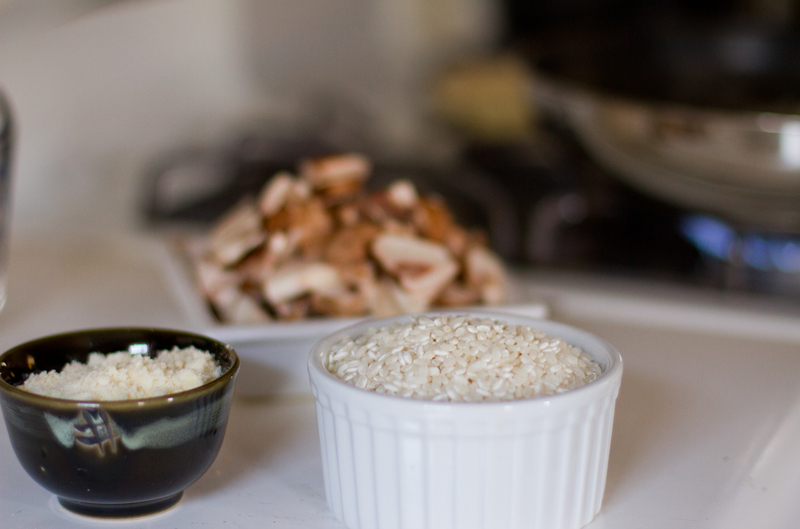 Stir until all liquid is absorbed by rice mixture, and then add in another 1/2 cup. Repeat the process until all of the hot stock has been added and the rice is tender. (Should take about 15 minutes for this step.) Add in the cheese, mix, and remove from heat. 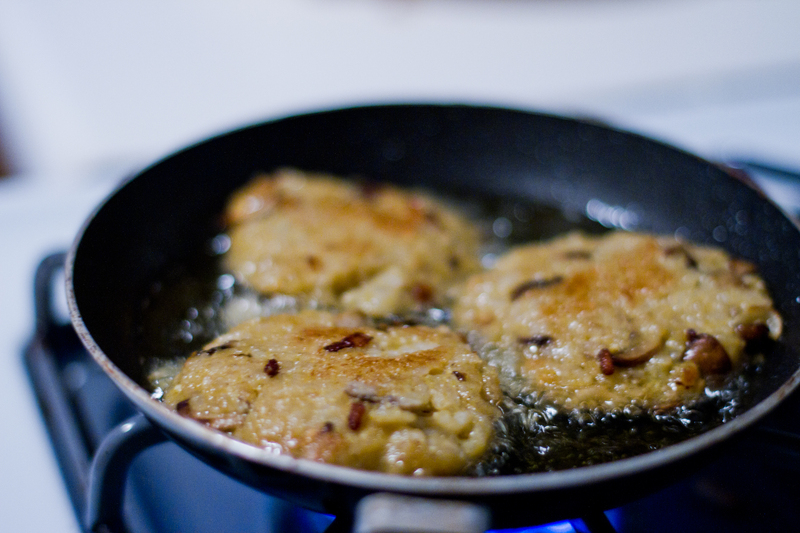 Cook fritters in hot oil for about 3-4 on each side until golden brown and crisp. Let drain on paper towels. 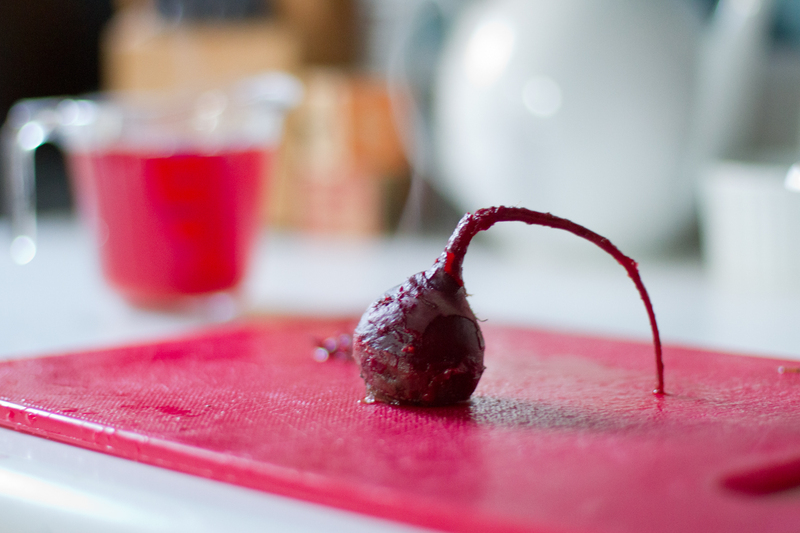 Boil the beets in a pan of water until tender/soft, about 15 minutes or so depending on the size of the beets. Drain and allow to cool slightly. Remove skins. 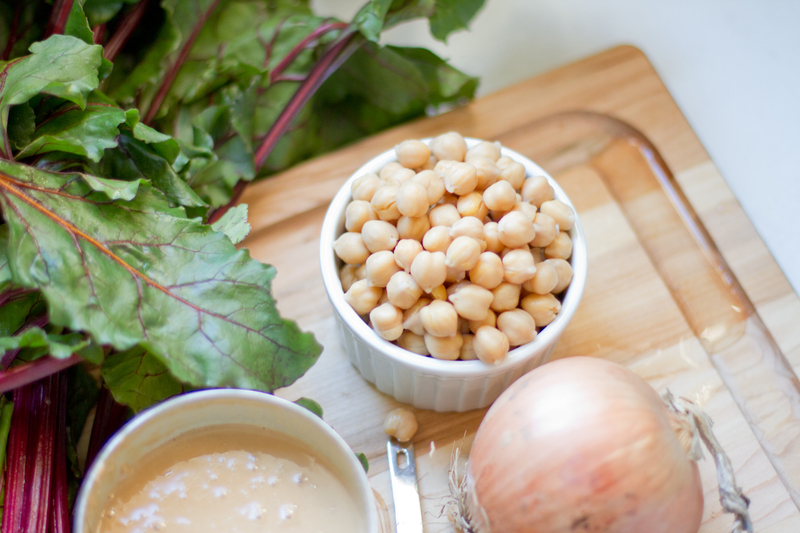 Chop beets and place into food processor with the chickpeas, tahini, garlic, lemon and cumin. YOu may have to do in batches depending on the size of your food processor. Looks great! What kind of gear did you shoot this with? For shooting food, I use a Canon 7D with a 50 mm fixed lens. And I try and shoot only when there’s good natural light. Thanks for reading! Nice, thanks for the tip so I can pass that over to my wife for shooting on her blog! Yep anytime! Oh is the beets really that good? Wow this is an explosion of color and taste! Can’t wait to try this recipe!! 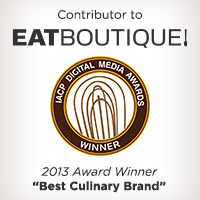 I’m a amateur blogger about food too! Swing by my blog and let me know what you think! Thanks! The color of the beet humus looks ravishing. Nice post!